Parkside Dental Team is a full-service dental practice in a prime location. Located near a busy shopping center on a major thoroughfare, you might think they don’t need help with advertising. But in an area with a lot of visual competition, location isn’t everything if you can’t capture the attention of potential customers. The four dentists that make up the practice questioned the impact of their static sign, which did little more than identify the practice. They were open to trying something new, and with the success of their double-faced 12mm Watchfire LED message center since its installation in June of 2014, they can quantify impressive results. Within the first month, their new patient count had increased by 25%. After 4 months, that increase was nearly 50%. 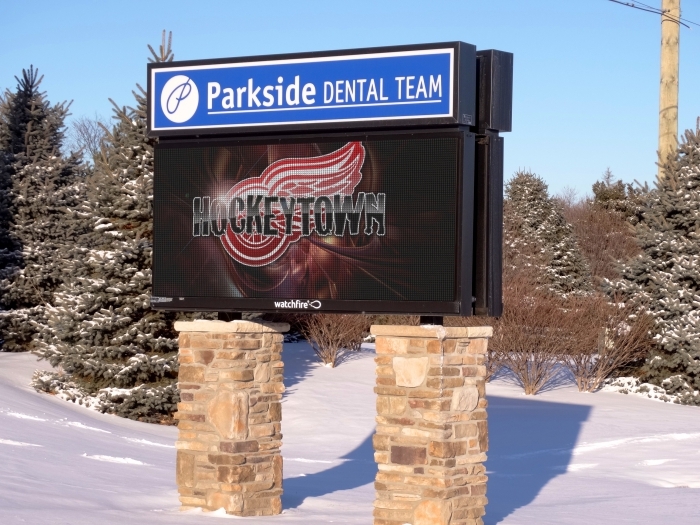 Parkside Dental Team estimates that the sign helped to bring in over $100,000 in new business in its first four months, more than enough to justify their investment.